John is a successful, smart, hard-driving litigator whose clients count on him when the clock is winding down and an incisive and innovative legal approach is the only way to win. John has a diverse, multidisciplinary background and expansive intellectual arsenal. In addition to the law, John has twin interests—and academic degrees in—business and the fine arts, grounding him in both the “numbers side” and “creative side” of the thought process. This duality in both substance and approach enables John to not only bring divergent perspectives to his work, but also to connect those perspectives, an ability that makes a difference in and outside of the courtroom. John uses arguments that push the boundaries beyond traditional interpretations of the law. The subject area of each matter John handles—whether intellectual property, product liability, antitrust, environmental, life sciences or antitrust litigation—is only one piece of the litigation puzzle. The more central piece is John’s ability to analyze data and create sophisticated, often groundbreaking legal reasoning that can be considered by the court. John understands the art of persuasion—and how to use it at trial. Good litigators argue cases. John goes beyond arguing. He uses logic, coupled with perception and knowledge of human decision-making, to craft legal arguments that are palatable to the people making the final calls in the courtroom. John is a “think on his feet” attorney who can construct a coherent story of a case in the middle of chaos and under eleventh-hour pressure. From the time a sequence of unanticipated events led to John playing a lead role in a major courtroom case as a first year associate, he has used his innate ability to hone in on the heart of a case, to organize an argument without getting bogged down in details and to improvise, all while thriving in seemingly overwhelming situations. Clients crave these skills when the chips are down, time is short and odds are against them. John “gets” that every client wants to win without breaking the bank. With this in mind, he uses budgeting and alternative billing arrangements to effectively meet client needs and stay within their expense expectations. And John goes beyond accurate cost assessments, making sure his clients understand exactly what services they get for their investment. 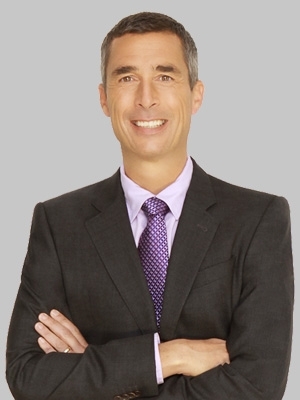 Within the firm, John serves as the Los Angeles litigation administrative partner. Secured $6.2 million jury verdict, affirmed on appeal, for Mighty Enterprises, Inc. in a breach of contract dispute with Taiwanese heavy equipment manufacturer She Hong Industrial Co. Ltd. before the U.S. District Court for the Central District of California. Represented an investment firm on appeal, against a $7 million unjust enrichment award following a finding of aiding and abetting a breach of fiduciary duty. Succeeded in having $7 million jury verdict reversed and remanded to the trial court for retrial. Following a three week trial, the jury awarded the plaintiff nothing. Represented a consumer product retailer in a trademark infringement action and obtained remittitur following an adverse jury verdict reducing the judgment by several hundred million dollars. Retained to represent a large pharmaceutical company during the trial of a trademark claim to represent the company on appeal in the event of an adverse judgment. Following an adverse judgment obtained a remittitur that reduced the judgment by more than $100 million and ultimately successfully represented the company on appeal. Represented a large pharmaceutical company in a case of wrongful death and loss of consortium following the death of a patient after the ingestion of pharmaceutical. Case thrown out on the eve of trial on motion in limine. Represented a real estate developer in a failed transaction against the seller of an office complex. Case settled following opening statements and during the testimony on the first witness. Represented most of the state of California in a three-month antitrust trial, the largest case of its kind in the state, which stemmed from the California energy crisis. The case settled for approximately $2 billion, with a $200 million attorneys’ fee award approved. Represented a large defense contractor in litigation against the United States in a CERCLA case to determine responsibility for cleanup of the contractor’s former aircraft manufacturing facility in California. John handled analysis of cost and accounting issues connected to the case. The matter was ultimately resolved with the government agreeing to assume one-half of the responsibility. Represented a defense contractor in a toxic tort action brought by resident living in the area surround the defense plant. Moved the matter to arbitration and successfully resolved more than 300 claims in the relatively short period of time. The creative process effectively reduced the transaction costs associated with such an action and allowed the client to cover most of the settlement with existing insurance. Substituted in as counsel of record for a real estate development company on a fraud and breach of contract case two weeks before trial. Successfully turned the case around to obtain a successful settlement for the developer on the eve of opening statements. Took over a theft-of-idea case against a consumer products company following an adverse jury verdict and a remand from a successful appeal. Obtained a multimillion-dollar settlement for the client on the eve of trial. Represented Shasta Technologies LLC in a complex case involving intellectual property, antitrust and patent disputes, as well as discovery issues, opposing LifeScan Scotland LTD, a Johnson & Johnson company. First-chaired a multimillion-dollar arbitration resulting from the sale of a business with a multitude of claims and counter-claims. Defeated the counter-claims and obtained a $900,000+ favorable judgment for his client. Second-chaired a three-week federal trademark action involving two similarly named consumer product companies, obtaining a favorable judgment at the trial court. Subsequently, John briefed the matter to the Ninth Circuit, where the case was affirmed in part and reversed in part. Played leadership role on trial team in 12-week case, defending Southern Pacific Railroad in a multibillion-dollar antitrust case brought by a Bechtel Corporation coal slurry pipeline company. John served as second chair for all claims brought by one of the two plaintiffs. A defense verdict was obtained. Served as co-counsel in an arbitration raising both copyright and patent claims relating to computer encryption technology. After three weeks of arbitration and a variety of motions the matter eventually settled. Represented actor in a two-week trial in the Federal District Court for the Central District of California in a breach of contract action against a consumer products company. The case was taken to verdict, ultimately resulting in client receiving a multimillion-dollar award. Prior to joining Fox Rothschild, John was a partner at a national law firm, serving as partner-in-charge of the firm’s Los Angeles office. Before that John had his own firm, O’Donnell & Shaeffer in Los Angeles for more than 10 years. John teaches New Media Law at Santa Clara School of Law and frequently lectures on a variety of topics. Trained as a fine artist as well as an attorney, John creates large-scale paintings and electronic music. He enjoys the challenge of creating something out of nothing. In addition, he is a dedicated practitioner of yoga as well as a voracious reader on an wide range of topics, from philosophy, mathematics and physics to fine art and religion.